Our beautiful Gracie has given birth to 7 puppies, 3 girls ,4 boys. Gracie is our family dog so puppies will be well socialised when ready to go as they are being bought up in our loving family home. They will be used to all house hold noises and used to being handled by adults and children. Puppies will be ready to leave around 21-3-2018 when they will be 8 weeks old. Puppies will leave with one of the best dry foods, royal canon which they have been weaned onto. A blanket with my scent and they will also be microchipped, moms is a cavachon and dad is a bichon both parents have great temperaments . Puppies have already began puppy pad training and are doing great. Puppies will be wormed every two weeks until they leave. Viewing now welcome and a 100 non refundable deposit will secure a puppy. 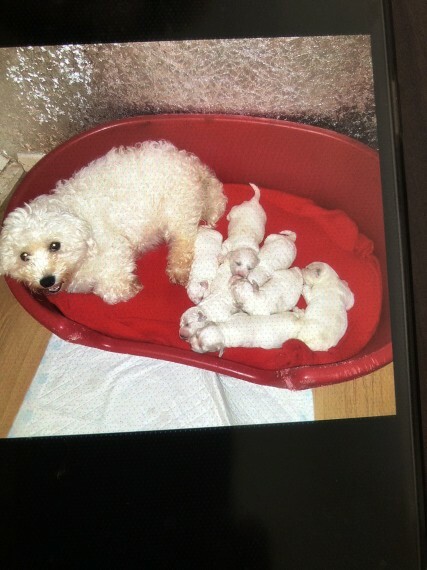 Mom can also be seen on viewing with her pups any more info then please just ring thanks.They are ready to go now.